Look, it's a LAVA BEAST. I wanted to do something flashy for this sauropod. It came out a little closer to something you'd see from Luis Rey, which I'm not that happy about, but I do like the color scheme. 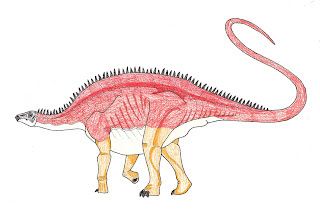 Notice that I drew the neck up, which is not a position you normally see for this sauropod. This is probably about as high as it could curl its neck, given the forward-sloping neural spines on the cervicals that would have severely limited dorsal flexion. I like the colour scheme! What was this poor guy supposed to eat, as he can't reach his neck up or (from the looks of it) reach the ground!? This and the Spinophorosaurus are absolutely gorgeous. The colour schemes are inspirational. Maybe you can colour all 24 of mine? Peter, I wonder about that too. Very little of the appendecular (spelling?) skeleton has been found, so many it had super-short legs? I don't know. But the neck was just ridiculously short. Mo, I'm glad you like it. I'm a little on-the-fence about Brachytrachelopan. I may yet end up Photoshopping the hell out of these pieces, despite my intent of staying true to "Inktober."